Is that the smell of rocket fuel in the air, or customer excitement? The reported 600+ customers waiting in line for a trip to space aboard SpaceShipTwo (nickname: Enterprise) surely must have been excited when the suborbital spaceship successfully sailed through another powered flight test today (Thursday). “SS2 has successfully completed another supersonic rocket-powered test flight! 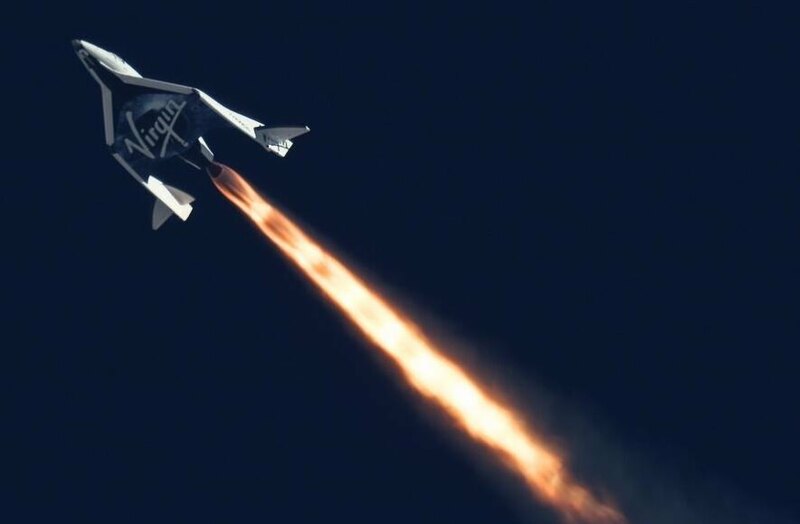 Hit our planned duration, altitude, and speed,” Virgin Galactic wrote on Twitter. SpaceShipTwo also tested a “feathering” system that it has on board to assist with controlled re-entry. It allows the entire tail of the spaceship to rotate up to about 65 degrees, which Virgin says allows fine control of the attitude as the spacecraft comes back to Earth. “The feather configuration is also highly stable, effectively giving the pilot a hands-free re-entry capability, something that has not been possible on spacecraft before,” Virgin said of the system on its website. The test, which started at about 8 a.m. Mojave time, saw the WhiteKnightTwo carrier aircraft take off from the Mojave Air and Space Port carrying SpaceShipTwo underneath. At 46,000 feet, pilots Mark Stucky and Clint Nichols released their spacecraft from the carrier and turned on the rocket motor for a 20-second burn. They climbed as high as 69,000 feet at a maximum speed of Mach 1.43, or 1.43 times the speed of sound. Reports say Branson and some members of his family will be on the first test flight. Should that go to plan, there is a parade of celebrities and ordinary citizens to come. Read more about SpaceShipTwo’s expected flight profile here. When is Universe Today planning giveaway tickets for SS2? If Dima wins, they’re giving their tickets to me. I don’t understand why Branson is limiting himself to suborbital flights. This is almost useless in terms of space technology. It’s useful if you want to go from Tokyo to New York in an hour, but that’s not the plan. This is just, “Hey look how high we got!” Until you can enter free orbit indefinitely and then reenter safely, it’s just a publicity stunt. And this spacecraft cannot even come close – if it got to even a fraction of orbital speed it would disintegrate instantly on contact with the atmosphere. Other companies are doing actual orbital work. The ISS has even been resupplied by private orbital ships. So why is Virgin Galactic even still in the news? because to fly on this spacecraft, it costs only $200,000. that is an unprecidented cost for spaceflight. even the shortest one manned suboribatal hops have cost millions of dollars and this allows a common middle to upper class citizen with some savings to go to space for the cost of two nice cars. It’s a start – and a very good one at that for a company offering some kind of elaborate sightseeing tourism!